FlightAware is a free Windows 8 flight tracking App that helps you to track your flight details so that you do not miss your flight. 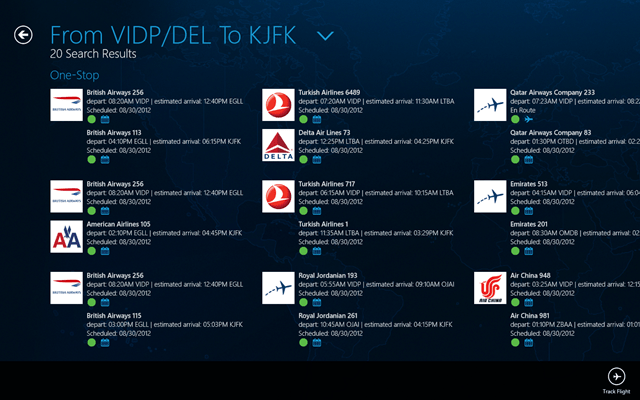 At this app for Windows 8, you can get all the information of the flights you want to know about. 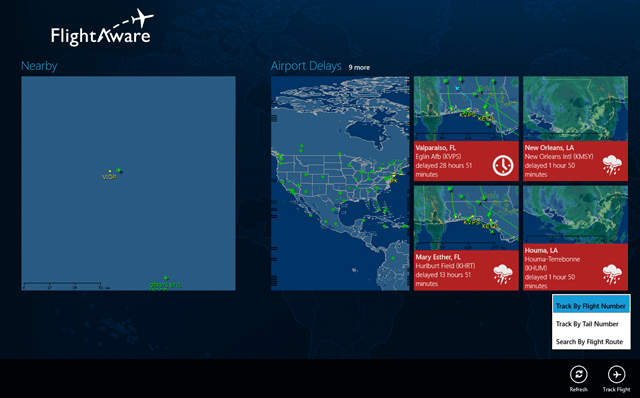 Just click on FlightAware Windows 8 app and you can view the nearby flights according to your location. You can have the map route of the nearby airport, as it will ask for your location permission. You can simply click on the map and can trace the path of the nearby flight. You can also search your desired flight with the help of flight number or simply by entering the tail number. This will let you find the flight route by entering the origin and destination of the particular flight you are searching for. Enter the details and you will get all the respective flights for that route. You can view the interface of this Windows 8 flight tracking app where you can watch the nearby airport from your location with the help of map route. Click on the Nearby option and ‘zoom in’ to watch the nearby flights or to trace the route. You can also enter the flight information for your own convenience and can simply check all the details of the flight. Here, you can see all the related flight for the route you have entered. And you can check each and every details about your flight like the departure timings or the arrival timings or may be the delay in your flight. You can also check the terminal number where you have to board the flight. You can simply check the delay in flights by clicking on the respective flight and can check the route with the cause of delay and also the time duration of the flight to be taken to cover the journey along with the average speed of the flight. 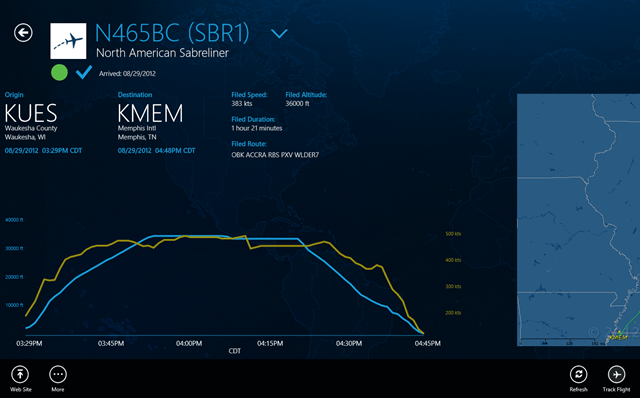 Just install this Windows 8 flight tracking app on your Windows 8 desktop and have track of the respective flights you want to board. Learn how to search an app in Windows 8 store.